TLDR – It’s called showing up and doing the work. Let me save you some wasted hours on the Internet. Whatever you’re trying to achieve, let me answer the question you’re unconsciously asking yourself. The answer is YES. Yes, there are hundreds of ways to do it better than the way you are thinking, and the way you will actually end up doing it, the first time. But if you never do anything, and you stay lost and slow, perpetually looking for the right way to do it, you will never get it done. Pick 2 and get moving. Then circle back to refine your process. Stop looking for better ways to avoid doing what’s necessary. Be so committed and purpose driven, that you will even do things inefficiently so long as they actually get done. If your purpose is powerful, if your vision is clear, and deeply rooted in your values, you would have the conviction to do what is hard, boring, and important to achieve the result. Putting off the work activity, to find the more efficient ways of doing it is counter-productive. It means you’re prioritizing efficiency over effectiveness. Binging on clickbait articles is the most common symptom. That’s how you got here and why I felt it was important to have this chat. Do yourself and me a favor. Stop reading them. The tips are generic fluff and totally useless. And real, savvy, smart, gritty, professionals hate writing them. They know those kinds of tips are too generic to be helpful or applicable to solve real problems. Let’s be honest, what you really yearn for are nuggets of wisdom, that are pragmatically viable, heartfelt, wicked smart, that align with your strategy and brand. That’s what I seek to offer. I’m not a coach. I consult and execute ideas, and help clients do the same. I get my hands dirty. I get paid to get things done and make an impact both materially for the client’s organization, culturally and energetically for the team and the individual. Real practitioners don’t rely on bumper sticker productivity tips. Let’s solve a big problem, holding you back right now. The Truth is… the most effective productivity tip of the 21st Century is to do the work. Do the hard, tedious and boring things, that you know are essential to achieving your goals. Don’t sacrifice effectiveness for the dream of more efficiency! Why is this a productivity tip? The most common problem I see with entrepreneurs, leaders, professionals, creatives, coaches, executives, and businesses of all sizes, is that they spend more time searching for productivity secrets and #growth-hacks than actually producing anything at all. They are lost consuming content, clickbait, courses, and programs. Don’t let this be you. If this is you. Take a moment to reflect and ask yourself if you’re on a path to get anything done or be an information consumer? You don’t need a coach or a consultant to get things done out of the gate. One of the reasons people get lost in this cycle is that there is an uptick in business models who consciously and unconsciously, directly and indirectly, convey a false belief that you are incapable of getting things done. They convey that achievement requires a coach for every single thing in life. It’s really gotten out of hand. So, when you’re “researching” on the Internet, pick 2 ideas and get moving on the actions. You’ll enjoy the zen and energy of actually doing, as opposed to thinking about doing. Circle back to refine your process later after taking action. There is a point of diminishing return when you become a well-read master of planning and yet the poorest practitioner of execution. Hear me on this: Who you are, where you are, with all that you have or don’t have, is good enough. wHO YOU ARE IS ready ENOUGH. AND WHO YOU ARE IS fully capable of achieving something great, and gettting something done, right frickin’ now! It’s easy to get lost in the addiction to be more productive and efficient, that you never take the time to actually become effective. Even a poorly executed plan beats an unexecuted idea. When you can stop dodging the work, and you find yourself naturally leaning into the difficult (seemingly tedious and boring bits), and are actually producing a result, then you can budget a little <—key word there, time to look for ways to improve efficiency. If you are spending so much time looking for ways to do things well or right, that you have no time to actually get anything done you need to stop. Here’s a little more Heroik sauce for ya. You don’t need to be rescued by an army of coaches or consultants to get more things done. You are every bit the hero you need to be in your life and practice. You will learn more getting your hands dirty and being fundamentally effective. Consultants, coaches are force multipliers and amplifiers. They are only effective at amplifying and expanding on what’s there. If your force and effectiveness is 0, it won’t matter how good they are, the result will be the same. This is why all the professionals who are worth it, prefer to work with functioning systems and people. It’s because they know that’s where they can make the most impact. Ultimately, all the other super heroes can’t do the work of leading your life for you. They can’t build the life you want for you. 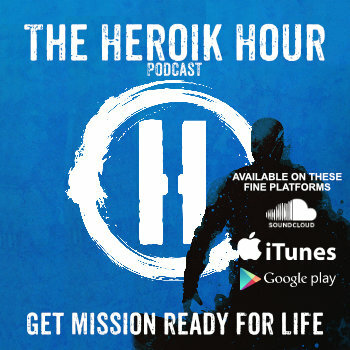 You have to step up, rise from the rubble and dysfunction, and become the Heroik leader you were born to be. Of course, you want to strike a balance between planning and executing. I get it and struggle there too at times. But, if you’re not in the habit of getting things done because you’re addicted to finding ways to get better, you now know exactly what you need to shift to improve your effectiveness. Get out there and Get Heroik.